Who is it for? 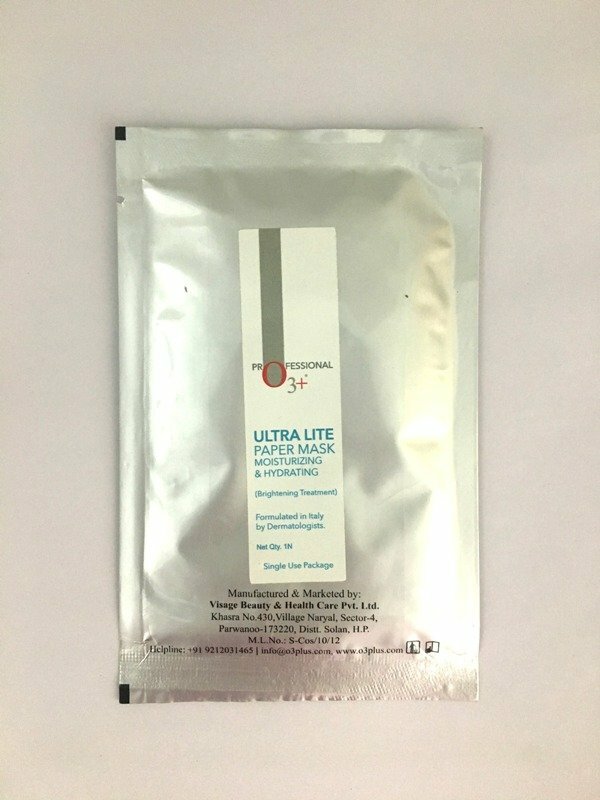 O3+ Ultra Lite Moisturising & Hydrating Paper Mask is perfect for dry skin types for the much-needed boost of moisture and glow. INR 100/- for one sheet mask (30ml). Cleanse the skin or enhance skin texture with toner. Take out the sheet and remove the film. Spread over the face adjusting from eyes to the nose. Take off after 10-20 minutes and pat lightly to absorb essence. This sheet mask comes in a glossy silver packaging. The packaging is minimalistic with no pictures but only the brand name and description. Ingredients and directions can be found on the back of the packet. When the package is opened, a fragrance is there which is definitely perfumed and not natural. It isn’t really bothersome. The color of the sheet and the serum is white. The mask seems to be made of cotton tissue which contains the white creamy serum. The sheet itself is thicker as compared to the sheet masks from other brands. The serum is quite a lot and may drip. The sheet mask has a film on it which needs to be removed before applying. This sheet mask has a film of butter paper on one side which needs to be removed before putting the sheet. To be honest the film is pretty pointless as the tissue mask is completely dipped in serum which penetrates to the other side as well. While removing the film most of the serum gets smeared on the hands and even drips. The process is irritatingly time-consuming as there are chances of tearing the sheet while removing the film. The sheet mask, however, fits really well and has cuts to fit the contours of the face. Around 20-30 minutes are sufficient to keep the mask as the entire serum wouldn’t really get absorbed or dry out. Remove and pat the skin. The serum is creamy and you will feel its sticky presence on the face after removing the mask. However keep patting and massaging and the serum will definitely get absorbed, leaving behind a glowy moisturized skin. I think it is a good idea to apply it before sleeping to get the best results the following day. If not, then one may wipe it lightly with a wet cotton/tissue and go on with the day. I have acne prone skin and it was a relief that it did not irritate my skin or clog the pores. The skin feels supple, moisturized and glowy for at least two days. Moisturise and hydrates the skin. Does not cause a problem for acne prone skin. The serum gets absorbed after a while and there is no stickiness later on. The film on the mask is pointless and the serum gets wasted in the process of removing it. Yes, I really liked this particular mask from O3+ as it worked well for my combination /acne prone skin as well. However, its the best bet for dry skin types.